Home » SFF Reviews » The Pride of Chanur: What does it mean to be an alien? The Pride of Chanur: What does it mean to be an alien? Cherryh’s The Pride of Chanur combines space opera with some gritty “hard-ish” SF elements in the beginning of a saga that deals with the political and economic ramifications of first contact. 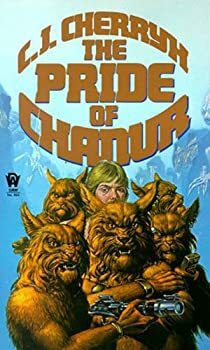 In this first volume of the CHANUR SAGA we follow the exploits of a crew of Hani (lion-like aliens) on the eponymous merchant space freighter The Pride of Chanur. Expecting nothing more than a routine run across their trade routes, Pyanfar Chanur, captain of the Pride, imagines the worst trouble she’s likely to have to deal with is her headstrong niece Hilfy. Of course she’s wrong and what was proving to be a rather boring trip becomes deadly as they run across trouble in the form of an alien stowaway while they are docked at the Meetpoint space station. The reader is thrust into the middle of things which quickly come to a head as Cherryh examines what appears to be one of her favourite tropes: the idea of the human being as alien. In this case our point of view characters are the lion-like Hani and our view of the lone human character is completely from the outside as the typical barriers of communication, biology and mind-set stand between full understanding. The Hani themselves are an alien species that is only one part of a precarious Compact between numerous alien races: the ape-like Mahendo’sat, the tall and whispy Stsho, and the long snouted and nefarious Kif, all of whom share at least a minimal biological similarity and exist in a precarious political balance of trade and travel. Added to this fragile structure are aliens of an even more strange make-up: several species of methane breathers whose biology and mind-set are a mystery even to those with whom they share space, but who barely manage to co-exist with the others. All that is needed to throw the entire political structure of the Compact off-balance is one secret advantage that can be exploited by one member race at the expense of the others. Enter Tully, a lone human in Compact space recently captured and tortured by the Kif in the hopes of gaining sole access to human space for exploitation, only to escape and seek refuge in the belly of The Pride of Chanur. Too altruistic to exploit or harm Tully, and too mistrusting of the wily Kif to return him to their clutches, Pyanfar cuts and runs in the hope that she can escape the Kif hunter ships and find refuge and aid among the people of her homeworld. Pyanfar hadn’t gambled on the single-mindedness of the Kif captain whose reputation and very existence now hinge upon regaining his lost prize and she gets much more than she bargained for as the Kif calls in more and more ally ships in a hunt across the galaxy and Pyanfar’s allies and options become thinner and thinner as her journey progresses. Cherryh covers a lot of ground in this first volume: what does it mean to be an alien? How do we communicate and interact with each other? How far should one go in the name of one’s principles at the expense of others’ lives? An especial concern for the Hani is the relation between genders. The Hani themselves have an interesting social make-up in which all males are confined to their homeworld due to their unsuitability to interacting with other races: they are far too violent and headstrong to be trusted amongst races whose ways and customs differ so greatly from their own and to whom the slightest insult could mean interstellar war. While the males rule the clan Holds that retain political power on their own world and seem to inspire some level of deference in their females, it becomes apparent that they do not do this without the aid of their high ranking wives and the fact that females control all interstellar travel and trade definitely makes the gender politics of the Hani interesting. One of Pyanfar’s greatest concerns is how to deal with a male alien amongst her all-female crew. I’m curious to see where this story goes: what will become of Tully and the entire human race now that it has been discovered by a society made up of multiple alien species? Are the Kif really as evil as they are painted in this volume or is there more to them than black hats? Will we ever learn more about the mysterious methane-breathers and their own designs within the Compact? I certainly enjoyed The Pride of Chanur enough to want to continue. Cherryh was made a SFWA Grand Master — well-deserved, I think. C.J. Cherryh’s books have always looked appealing for their focus on complex political, social, and military themes, along with the human as alien concept. The same goes for her broader Alliance/Union series – I really want to read Downbelow Station and Cyteen since they won the Hugo Award. What books have you read so far? I recently re-read the Chanur series and found that they held up quite well, considering. Reading about Pyanfar again was like meeting an old friend. The Faded Sun trilogy is (was?) a favourite, and I believe my original introduction to her work was “Hunter of Worlds” (several “alien” species, including a human, as slaves/servants of a dominant predator species, if I remember correctly; a wonderful introduction to Cherryh’s ability to think outside the human box). I’ve read most of what she’s written, though it took me a while to get around to Cyteen. And among her most haunting settings is the barrow landscape in one of the Morgaine novels — memorable. The first thing I read was the Faded Sun Trilogy (and I think it was the first thing she published). It knocked me out. I liked Hunter of Worlds precisely because she depicted that predator/prey dynamic so perfectly. I didn’t remember the humans being exactly slaves; I thought a human ended up on their ship, and how his behavior triggered predatory responses just about every second. Tizz, Wave Without a Shore was quite different. Have you read it? What did you think of it? Wave without a Shore was one book I was unable to get hold of at the time — I was living abroad and those were the days of dead tree books only and much hanging around in furrin railway station bookshops, the only ones that stocked non-literary English language titles. But thanks for reminding me — something to look forward to! It’s quite different; shorter, almost a novella or a long prose poem, but I remember that I liked it. I’ve actually read very little of Cherryh’s overall oeuvre. Other than _The Pride of Chanur_ I’ve only read _Angel with the Sword_ and _Gate of Ivrel_, but I thoroughly enjoyed both. I want to read her Alliance-Union series, but unfortunately I bounced off of _Downbelow Station_ the first time I tried it, though I do hope to try again. I think Cherryh has great talent and certainly deserves the title Grand Master, but I must admit that there is often something about her writing that can put me off and so far I have found it the case that while I enjoy individual works of hers, I can’t say that she’s the kind of author for whom I can pick up any of her novels and be assured I will enjoy them. I’m still trying to put my finger on exactly why that is, though. I think her work’s a bit formal, and a little remote, at times.